Pearls – types of pearl and what to consider when stringing. Calculating thread thickness, needle size and length of thread. How to professionally finish the piece. Stringing of a freshwater pearl bracelet with a sterling silver clasp. 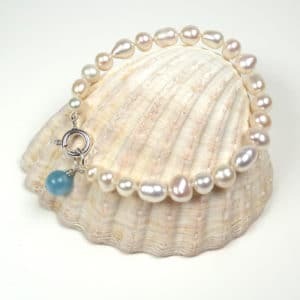 Included in the £60 price of the course will be all the materials needed to make one freshwater pearl bracelet with a sterling silver clasp. Also, an endless supply of hot drinks and delicious biscuits. What better way can you think of to spend a Wednesday in January than learning a new skill and creating something beautiful to wear?